If you're anything like us, you've probably left your Christmas shopping until the last minute. Perhaps you're too busy at work, maybe you've forgotten that Christmas is the time of giving, or maybe you just haven't found the right gift yet. That's where we'll step in to give you some ideas. We've tried to select only products that are affordable, but a few expensive ones have crept in. Either way, we're not going to tell you how much to spend; after all, it depends on the person you're buying for, so good luck and happy shopping. Solid state drives are a good option for your family members or close friends who are computer geeks. They will speed up the performance of a laptop while helping reduce its heat output. The sweet spot capacity is around 128GB and there are different prices for faster drives, too. In this guide, we're giving a shout-out to the Samsung SSD 840 Pro, the SanDisk Extreme II SSD, and the Seagate SSD 600. All of these drives put up read speeds over 500 megabytes per second (MBps) in CrystalDiskMark, with write speeds that weren't far behind. Buy an external hard drive as a gift for just about anyone who owns a PC or laptop. As the saying goes, you can never have too much storage space, so even if the person you're buying for already has an external hard drive, giving them another one won't hurt. Prices start from under $100 for most portable drives, too. Opt for a Seagate Slim, a Toshiba Canvio, or a WD My Passport drive. Buying phone accessories is a bit of a challenge if you don't know what type of phone the person uses, so only consider a gift of this nature if you're absolutely sure of the camp in which your giftee resides. One of our favourite gifts is a mobile charger. For Android, look for a Sony CPV battery, which connects via micro-USB. 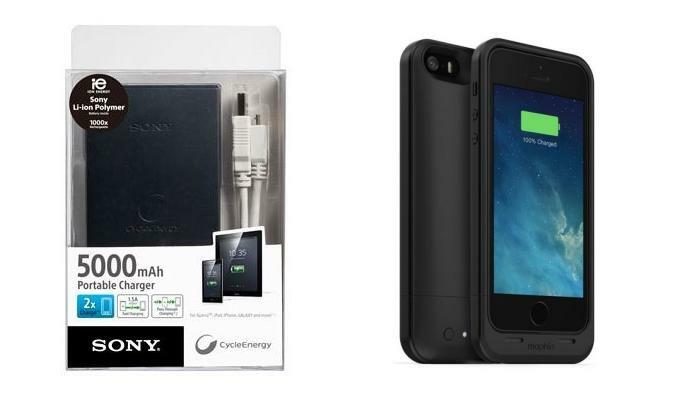 For iPhones, look for the Mophie Juice Pack. Cases can be a personal thing, but if you know someone who is active, they might be able to put a protective case to good use. Look for a Lifeproof case or an OtterBox (they're available for iPhone and Samsung Galaxy S4). We're also fans of the Tech 21 Impactology cases. Imation's 2-in-1 USB stick is a good stocking stuffer for an Android user. It can be used to easily transfer data between a computer and a phone without the use of cables or a cloud service. Jaycar has some nifty little printer docks that can be used with smartphones (there are versions for both Android and iPhone). We haven't used these Bolle printers yet, but they sure do look interesting. They are based on the dye sublimation printing process and produce 300dpi prints on 4x6in sized paper. If you do give one of these, though, make sure you also give a couple of extra packs of consumables, because there's nothing worse than having a ton of a fun with a printer like this, only to run out of paper. Hmm, this could end up being a very expensive gift. This is Kogan's UFO drone. It has four powerful rotors on it (that will cut you if you're not careful) and it's definitely not recommended for indoor use. Take this thing out to the park on a calm day and have some fun capturing video from a high altitude (yes, it does have a built-in camera). It's $199 worth of foam, motors, plastic bits, and a reasonably basic remote control that contains a throttle, a control stick, and some other buttons we have no idea about (probably why we kept crashing the thing). Here it is airborne with Sydney harbour in the background. Our poor piloting meant we couldn't get a nice angled shot of it. You'll have to make do with the side view for now. Pioneer has a nifty little DJ controller called the WeGO2. It can work with either iOS devices directly, or when connected to PCs running the supplied Virtual DJ software. It has stacks of features that allow you to mix music properly, including waveform views and flashing LEDs for beat-matching, and you can even create your own samples. It's actually a pretty advanced piece of kit, despite being so small and portable. If you're looking for an Android tablet, check out Lenovo's latest Yoga offering, which is slightly different from the norm. It's a tablet that has a comfortable holding point on one side, and it comes with a built-in stand so that you can easily sit it on a table to watch videos. Maybe you want a tablet for your child. Samsung has a kids tablet that's basically a regular tablet wrapped in a large case with a carry handle. Some of the tests we undertook showed that kids will indeed love playing with this tablet. If you're after a Windows tablet for someone you don't really like (we're just joking, Windows 8.1 tablets are great, especially hybrids), then the ASUS Transformer Book T100 is an excellent choice. It features the latest generation Intel Atom CPU (which is quicker than the previous generation), and it's basically a 10.1in tablet with a detachable keyboard. Any young person will probably love it if you get them a set of Beats headphones, which are pretty much the current in-thing as far as brand names are concerned. As an alternative, we like Sennheiser's Momentum On-Ear heapdhones, which sound excellent and look and feel great to wear. If you're looking for some quality ear buds, we can definitely recommend the Polk Nue Voe, which are light and sit comfortably in the ear, and they put out great sound quality. For a keen jogger, look for the Monster iSport Victory. For Bluetooth speakers (which seem to be all the rage at the moment), we recommend the Bose Soundlink Mini. It's a classy product that's perfect for trashy music. For anyone you know trying to get fit (or even anyone who is already fit but wants to get fitter), an activity tracker from Fitbit is the way to go. We like the Zip, but the Flex is also a good option. If you know someone with a new iPad, perhaps get them a keyboard case for it. Logitech has released a bunch that look pretty good to us. Get an action camera for anyone you know who's a bit of a thrill-seeker and who wants to capture their adventures on camera. GoPro has a few different cams to consider, including the HD Hero3, which comes with a waterproof housing. We hope this guide gives you some ideas for the pressies you've left so late to buy. From all of us here at Good Gear Guide, we wish you a Merry Christmas, and a safe and happy New Year.